Gregor Fisher – better known to his army of fans across the North Channel as Rab C. Nesbitt – is bringing his unique brand of comedy to Belfast in a riotous and provocative new production that has already taken Scotland by storm. Glasgow, 1977: The Minerva Fish Bar is shuttered and silent – a derelict shadow of the busy hot food shop that it once was. But the building’s not for sale as the Russo family motto will never be abandoned – ‘She Shall Rise Again And All Shall Be Well’. What happened to the Minerva? Well, it was hit by a tornado in the form of an old woman with a prodigious appetite. Having scoffed the Minerva into bankruptcy, 100-year-old Granny is going through the Russo kitchen cabinets like a swarm of locusts, and after eating her family out of business, she’s now threatening to eat them out of house and home. The bold and raucous comedy Yer Granny, which plays at the Lyric Theatre next week, is a Scottish adaptation of a smash-hit Argentinian play and features among its cast some of Scotland’s best-loved film and television performers. Proud head of the family Cammy (Jonathan Watson) is determined that the Minerva will be restored to its former glory in time for the Golden Jubilee visit of the queen to Glasgow. In the tiny flat above the cold deep-fryers, Cammy dreams of Her Maj dropping by for a battered sausage supper. But before he can turn the Russo family fortunes around, Cammy is going to have to do something about the eating machine in the corner, Granny (Gregor Fisher), who’s showing no sign of easing up as the years go by. La Nona premiered in Buenos Aires in 1977 and its unique brand of comedy and universal themes of family and conflict have seen it performed in countries around the world. A BBC production in 1991, with Les Dawson as Granny and featuring Jim Broadbent and Jane Horrocks, proved a big hit. 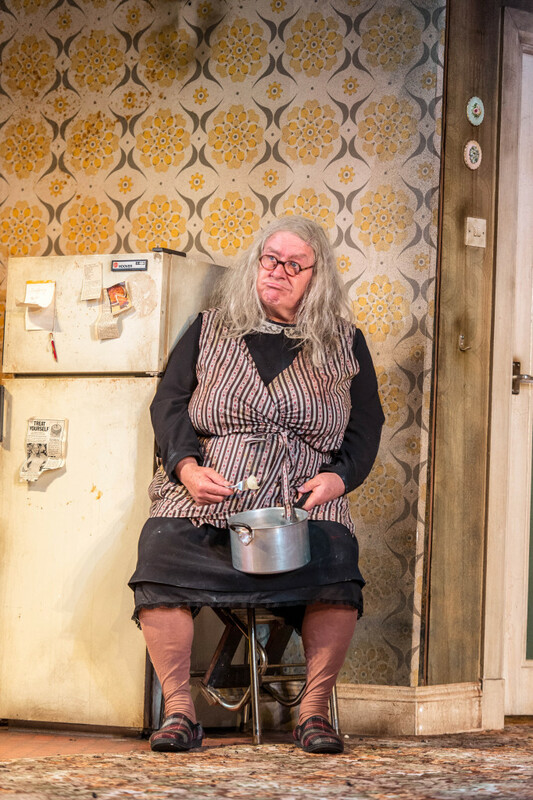 The Scottish production of La Nona – Yer Granny – has been adapted for the National Theatre of Scotland by award-winning playwright Douglas Maxwell and is directed by Graham McLaren. The Guardian praised the cast for their “salty, saucy, vinegar-sharp performances”.